View from the gardens of the Hartwell House. It was originally built in the 17th century, probably by Alexander Hampton. The large, elaborate formal gardens were created for the next owners, the Lee family in 1690. They included walks, avenues, geometric ponds and a topiary. By the 1760s this was replaced by a more informal style of landscaping, which was probably created by Richard Woods. 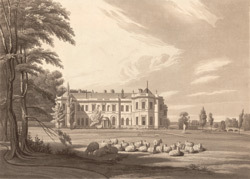 Major changes were made to the mansion during the 18th century.